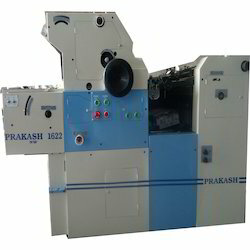 Leading Manufacturer of single color paper printing machine from Faridabad. With the assistance of our deft team of professionals, we are able to introduce a broad array of Single Color Paper Printing Machine. The offered machine is developed in accordance with industry norms and quality parameters. In the offered machine, all the components and material used have been approved and certified by agencies. In addition, each numbering mount can be installed in 7 horizontal numbering boxes. Further, the cylinder shaft can also be installed in 7 mount rings, maximum 49 numbering boxes; for vertical numbering box, each numbering mount can install in 5 numbering boxes, maximum 35 numbering boxes can be attained.